As expected, the 520 is ‘named’ after the movement it uses, and is a day / date model. Again this is as expected, since Citizen’s convention in their movement numbers is generally (but not always!) to use the first number ‘2’ (i.e. 5202) to indicate a day and date watch, whilst the first ‘4’(i.e. 5400) indicates date only. 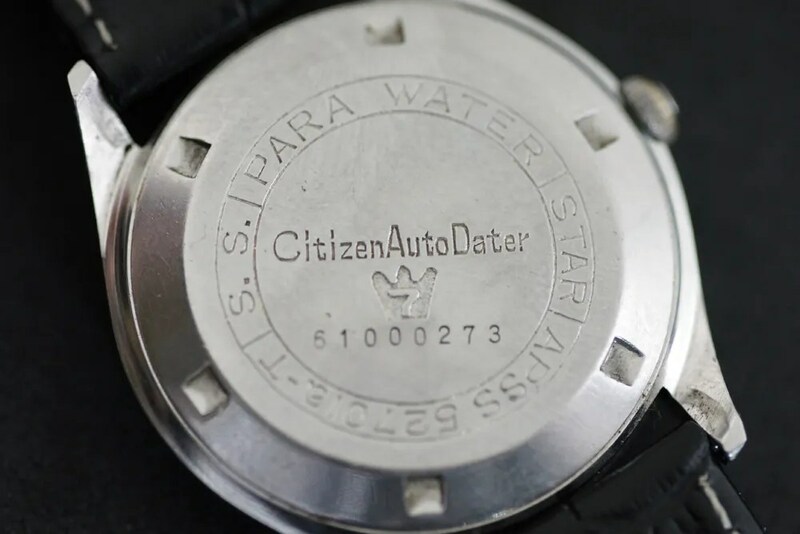 This entry was posted in Vintage Watches and tagged Citizen 520, Vintage Citizen Auto Dater, Vintage Citizen Crystal Seven. Bookmark the permalink. 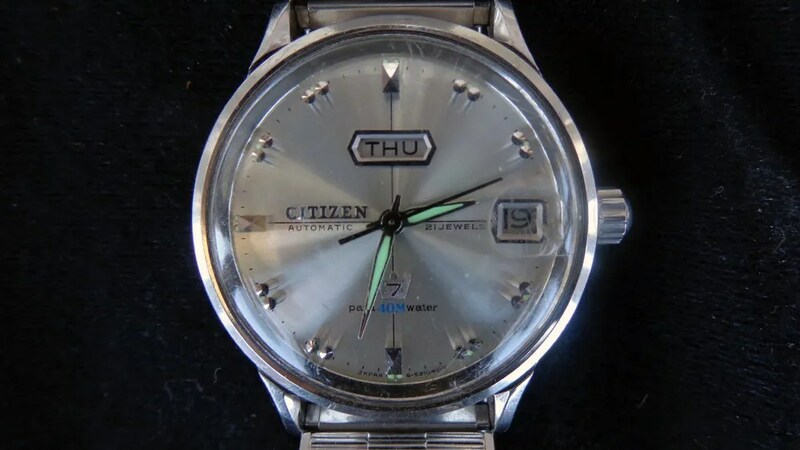 Wow, that’s a rare vintage Citizen watch you have. Nice! Thanks Desmond – I guess the Crystal Seven line was more popular at the time so not as many of these, and the 540 model, were sold. yo tengo 2 citizen autodater 520 igual a ese, solo que son dorados, uno esta en buen estado y el otro aun lo tengo que arreglar de la caja, pero como dices es muy raro ver uno de estos. 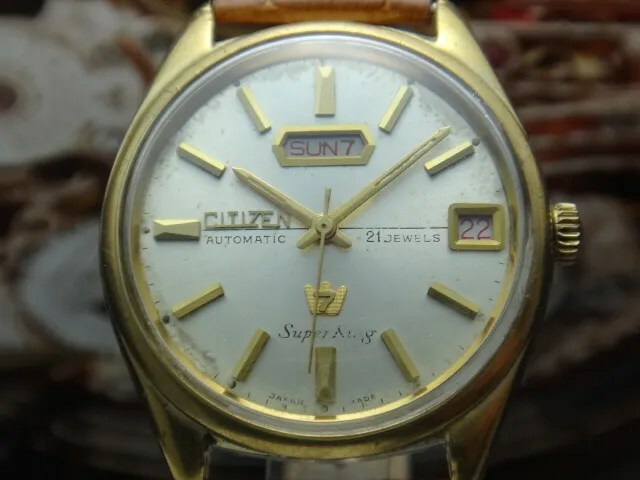 I have 2 520 autodater citizen equal to that only which are gold, one is in good condition and one even I have to fix the box, but as you say is very rare to see one of these. pero como vinculo las fotos aqui? 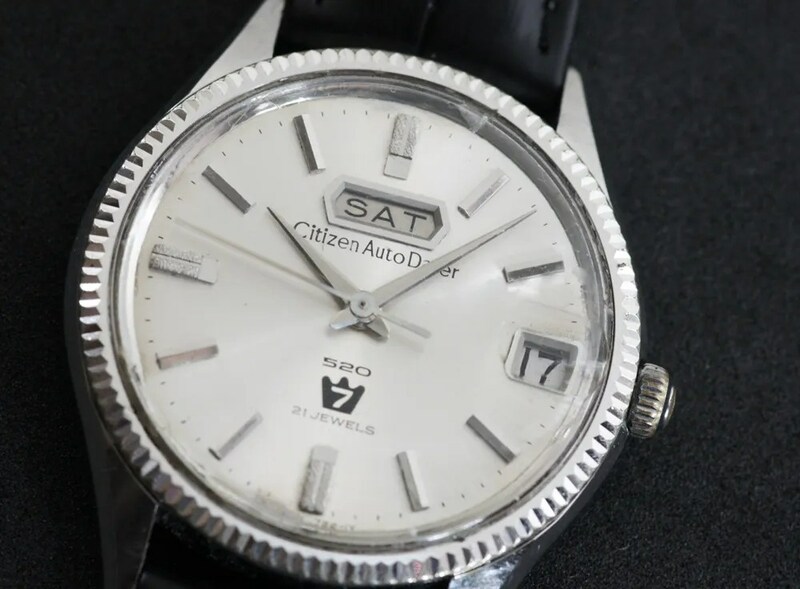 hi, i have my fathers 1964 citizen seven autodater watch. there is some scratch on the front glass. how can i change the glass and where i find it. I’m afraid it’s going to be just about impossible to find an original glass for it, but a good watch maker should be able to replace it with a suitable one. I’m not a watch maker so I don’t know exactly how it is done. 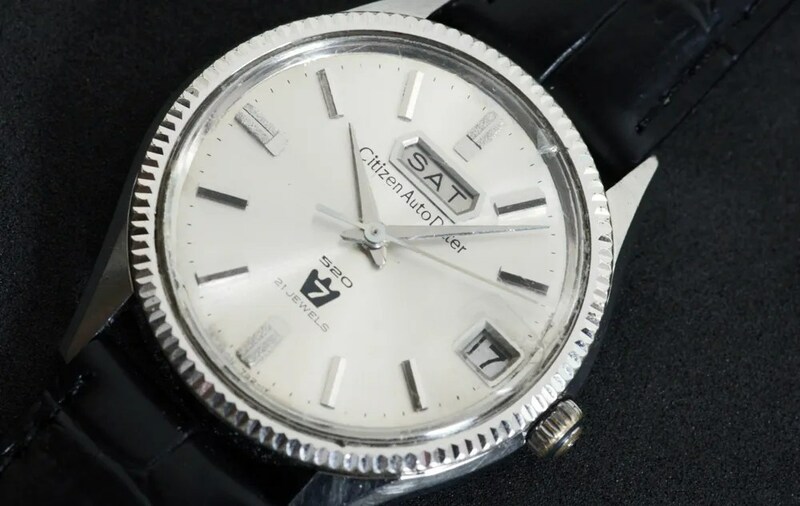 Since it is a Seven Autodater and not a ‘Crystal Seven’ I think it will have an acrylic (plastic) crystal rather than hard mineral glass. How bad are the scratches? If they are not too deep, it is possible to polish acrylic ‘glass’ and they can be improved a great deal. 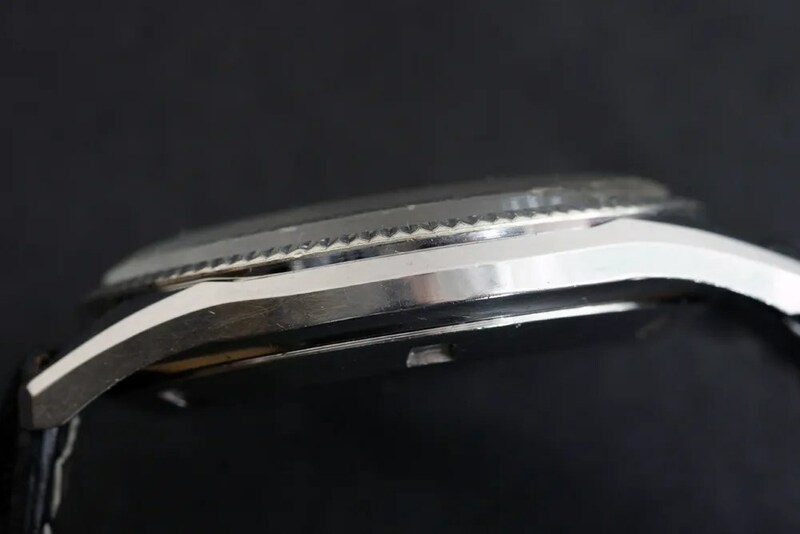 Here’s a link to a tutorial on how to do it – I’ve had some great success in doing this myself, and if the dial is in good condition, it can transform the look of a watch. Have just picked up a watch, but am not sure where it fits into the scheme of time, model and name. 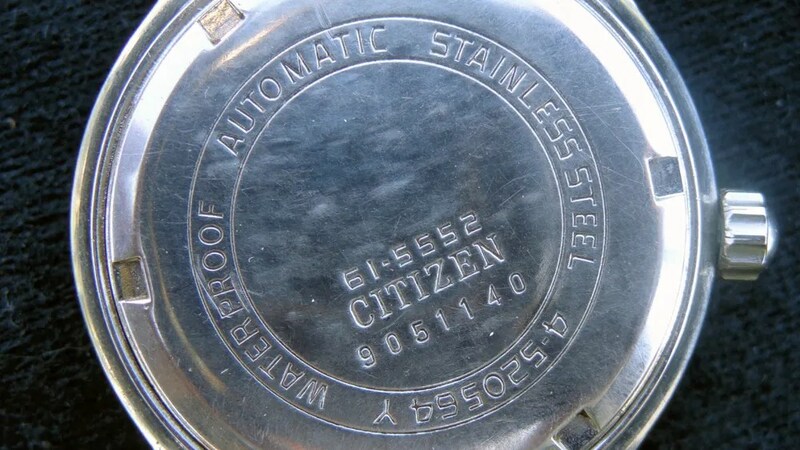 Back is labeled Stainless, Waterproof, Automatic, 61-5552, Citizen, 9051140m 4-520564 Y ……. 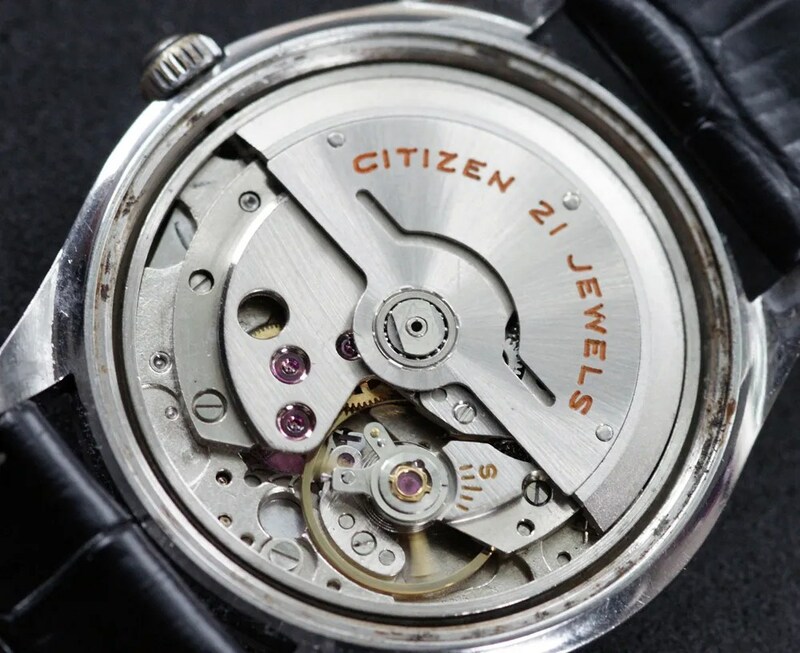 Front case reads on left side CITIZEN above Automatic and on right side 21 JEWELS. Bottom of front face reads Japan 6 521045-Y …… Has yellow-green lumed hour and minute hands and 7 in a crown above para 40M water and all else is in chrome or stainless finish, including face color. Is this the newer swinging weight movement, and am I correct in thinking that this is made in May of 1969? Thank you Sweephand for any info. Hi George, it sounds to me that you have an export version (note it’s marked ‘waterproof’rather than ‘parawater’) of the 520 auto-dater. I presume it has date and day windows – where are they positioned? 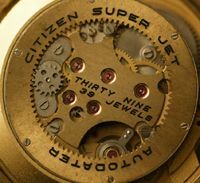 The case number indicates the 52 movement which is the swinging weight type as also used in the Crystal Seven line. Export models often have different dials, without the model name on them, even if in this case it’s only the number ‘520’! You’re right that the production date is May 1969 – it would be one of the last of these models, and by 1969 would have been superseded in the Japanese domestic market by the 72 series. The Day is located beneath the 12:00 position, and the date is located next to the 3:00 position. 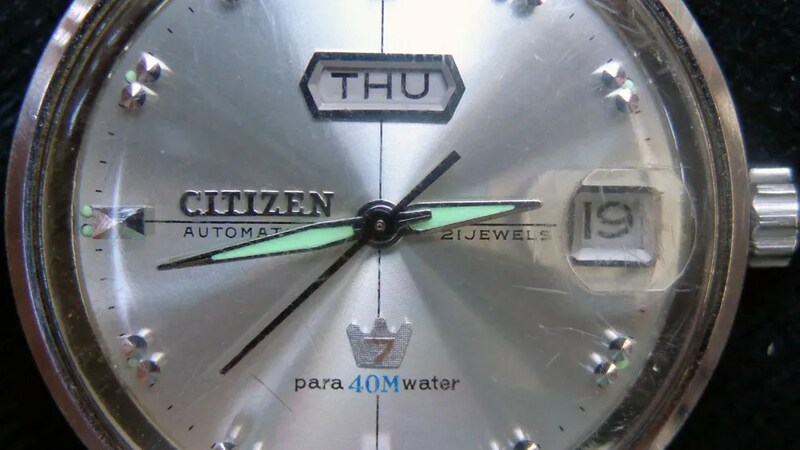 There is a line running from 9:00 position to the 3:00 position with Citizen above it on the left (facing watch) above automatic and 21 Jewels on the right side. The surface of the crystal has a raised ‘bubble’ over the date window and the case is smooth around the edge of the crystal, unlike the 520 shown above. I wondered if it was normal that it had Para40Water on the front, and WaterProof on the back, but figured that it was moving toward a change. 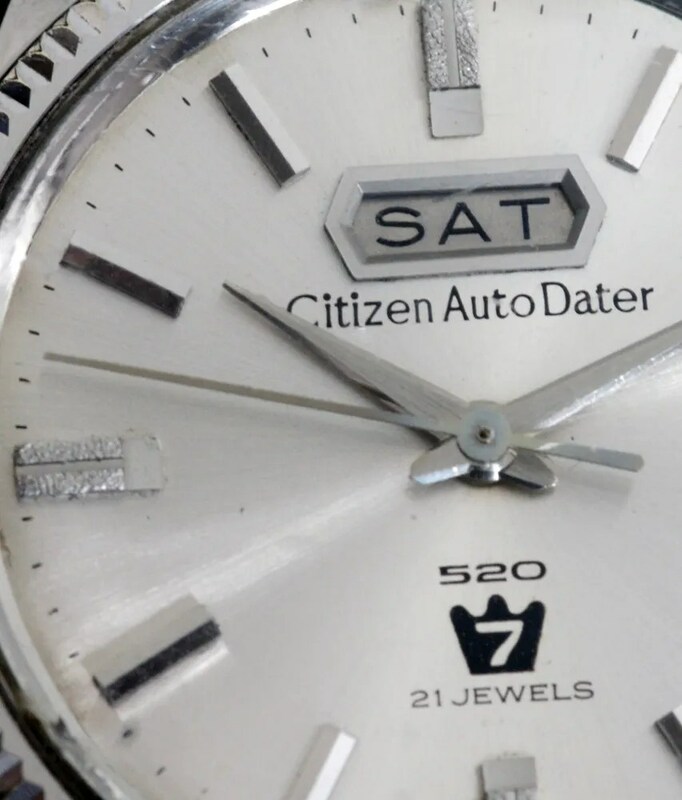 It seems to be losing about one minute in 36 hours so far, and is much quieter winding (automatically) than my 1966 CitizenAutoDater 25 Jewel with ring winder. Looking at it, I didn’t think that the hour markers were lumed, but noticed in the dark, that they glowed too, at least for a while! It also has the squared off day window of the 520, rather than the more rounded window of my older AutoDater. Is it possible to get new crystals for these watches? 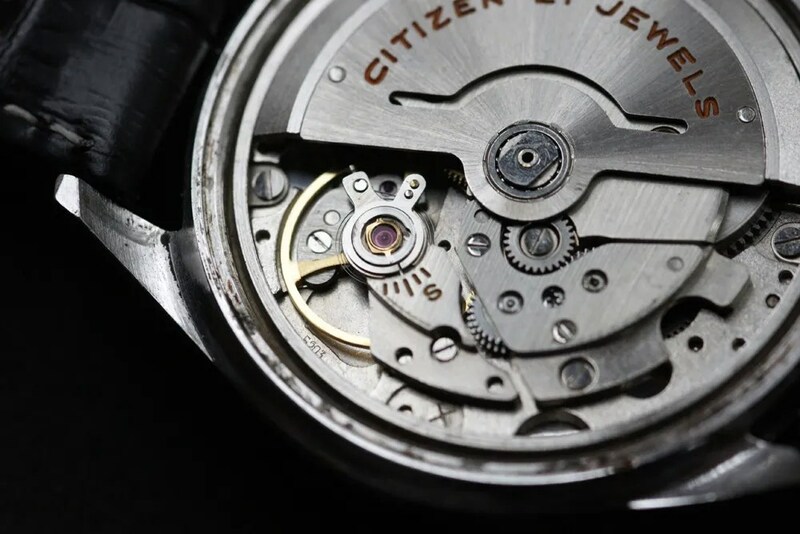 In my small town, the jewelers send mechanical watches to Philadelphia, Pa for repair, and I was quoted 250 dollars to clean one of my Citizens, I’m afraid to ask how much to replace a crystal! The ‘Para40Water’ is a bit of a puzzle when the back is marked ‘proof’. I don’t think any of the 520’s I’ve seen have been marked parawater on the dial. 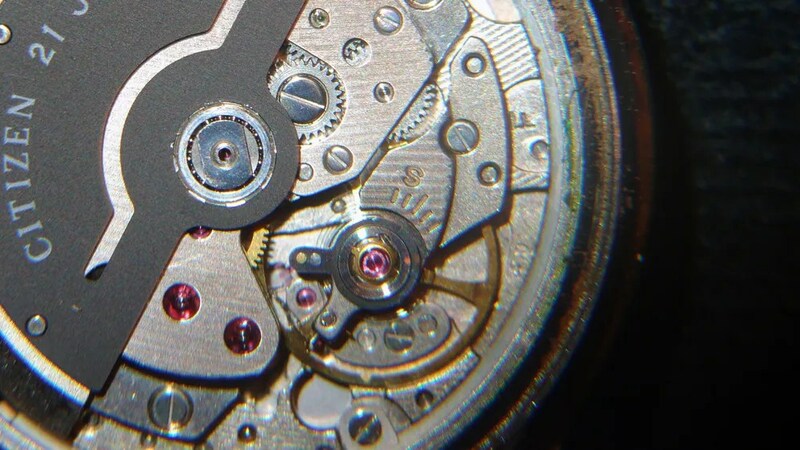 If you can get the back off it would be interesting to see just what movement is in it – it should be stamped near the balance wheel, and would be ‘5203’ if it’s the same as the 520. Time keeping doesn’t seem too bad, and like you I’ve found that the swinging weight rotors are quieter than the Jet rotors, which can be quite noisy. Replacement parts are going to be just about impossible to find. 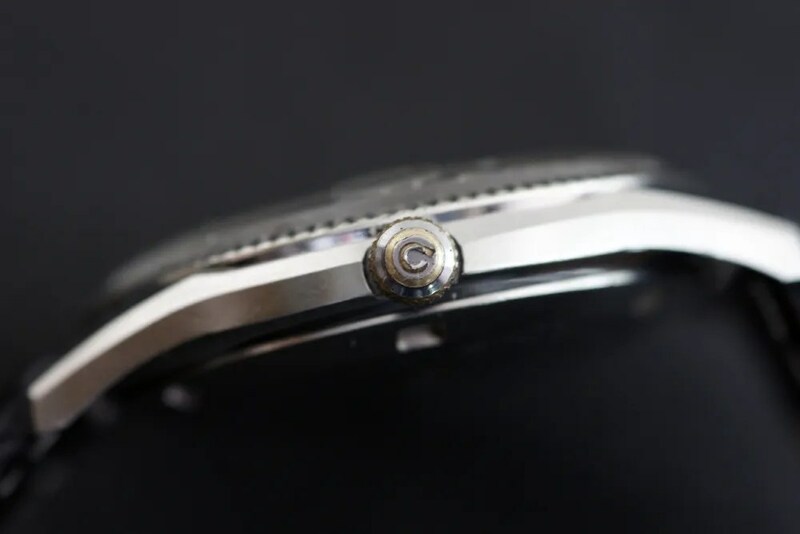 A competent watch repairer should be able to find a new replacement crystal to fit I would think and I’d expect that would be cheaper than a service since it’s a lot less work! Now I’m wondering what I’ve got here! Mix and Match, or what? Compared to the photo of the SuperKing, the differences are the Para40Water and that the time designators are two pyramidal blocks, rather than the rectangular blocks of the SuperKing. NB: you can’t post images directly but can link to a URL, or I can e-mail you and you could send to me if you wish. Edit the time designators, they are short conical rods, and are at 1,2 – 4,5 – 7,8 – 10 and 11. 12, 6 and 9 are pyramidal markers. One question, should any lubrication be placed on the threads of the back after it has been removed? Hi George, a little silicon grease (specifically for watches) can be applied to the gasket, to keep it soft. Not too much so it doesn’t get anywhere else! Other than cleaning the threads nothing is needed on them. If you’ll email me, I’ll send you photos, and you can discard, edit or post to be most informative. My Pleasure SweepHand! 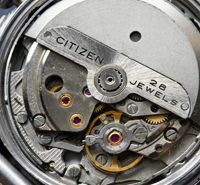 It is really nice to know the history behind the watches that we find, Thank You for your site and forum! Steven, Please send me an email, as I think I have a very rare one, Pete. Hi Steve, You got my pic of my Citizens, Is the 520 missing a emblem 7? As you can see they are all in very nice condition. Thanks Pete. Hi Pete – the dial on yours is fine. I’ve just sent you an email, with a pic of another example. 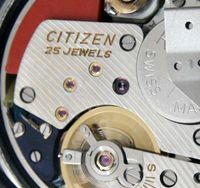 Some 520’s have the 7 emblem printed on the dial but not this model, i.e. with the day window at 6 o’clock. 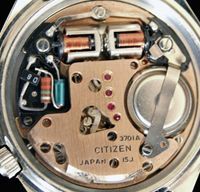 Hi Steve, The pic you sent of the Citizen 520 has the wrong hands on it, mine are correct, as the watch has never been serviced, well no watchmakers marks inside back case. Hi Pete – didn’t really look at the hands, just wanted to confirm that your watch dial wasn’t missing anything! 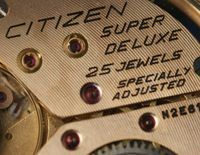 I have a citizen auto dater 520 21 Jewel can you tell me more about it?